21 December 2015. CRISPR Therapeutics and the drug company Bayer AG are forming a joint venture to develop gene-editing therapies for three types of genetic diseases, and later for other human and agricultural applications. The deal calls for Bayer AG, in Leverkusen, Germany, to invest at least $300 million in the joint venture and take an ownership stake in CRISPR Therapeutics, a start-up biotechnology enterprise in Cambridge, Massachusetts and Basel, Switzerland. 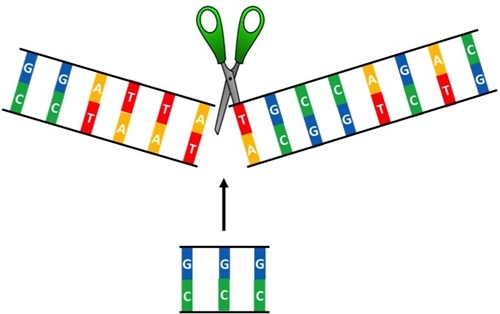 CRISPR, short for clustered, regularly interspaced short palindromic repeats, makes it possible to edit genomes of organisms harnessing bacterial defense mechanisms that use RNA to identify and monitor precise locations in DNA. The actual editing is done by the CRISPR-associated protein 9, or Cas9, enzyme that programs RNA to silence genes and provide immunity against invading genetic material. Cas9 also harnesses RNA to cut DNA at precise points in genomes, making it possible to delete, insert, or correct defects in human genomes. CRISPR Therapeutics, founded in April 2014, is developing treatments for genetic disorders, where disease-causing mutations are inherited from one or both parents. The company was founded by Emmanuelle Charpentier, a professor at the Helmholtz Centre for Infection Research in Braunschweig, Germany. Charpentier led teams that published pioneering research on gene editing in the journal Science in 2012, and an article in Nature a year earlier. Four other genetics researchers co-founded the company, including Craig Mello, a 2006 Nobel laureate at University of Massachusetts Medical School. The deal with Bayer calls for the two companies to establish a joint venture, headquartered in London, U.K., where Bayer plans to gain exclusive rights to develop gene-editing treatments for inherited blood disorders, blindness, and congenital heart diseases. CRISPR Therapeutics will also gain access to Bayer’s translational expertise in these types of diseases as well as Bayer’s work with protein engineering. Any insights generated from the joint venture’s work with CRISPR-Cas9 will be shared between the parties, with CRISPR Therapeutics gaining rights to human applications of the technology, and Bayer securing rights to applications in non-human organisms, including agricultural uses. Bayer will invest $300 million in the joint venture over the next 5 years. In addition, Bayer will gain a minority equity stake in CRISPR Therapeutics for $35 million in cash. Bayer says the deal is the first investment of its LifeScience Center, an initiative that plans to form partnerships with entrepreneurial companies to develop new types of treatments. Until permanent management is in place, Axel Bouchon who heads Bayer’s LifeScience Center will be the joint venture’s interim CEO and Rodger Novak, CEO and co-founder of CRISPR Therapeutics will be the venture’s board chair. The joint venture with Bayer s the latest in a series of collaborations for CRISPR Therapeutics. In October 2015, as reported in Science & Enterprise, Vertex Pharmaceuticals agreed to license the company’s gene-editing technology to treat cystic fibrosis and inherited blood disorders such as sickle cell disease. CRISPR Therapeutics gave no indication how the joint venture with Bayer, which includes development of therapies for blood disorders, will affect the earlier agreement with Vertex. Finance, Intellectual property, Joint ventures/collaborations biomedical, biotechnology, equity, Europe, genomics, investment, licensing, life sciences, pharmaceuticals, U.K.